At Mendle Nursery we specialise in Sempervivum, Jovibarba and Saxifrages. The nursery was created in 1988 as a result of our favourite hobby. 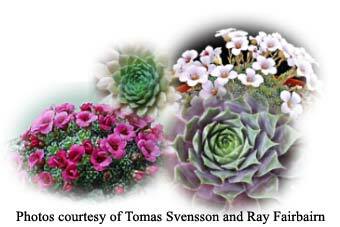 We have always been interested in plants with an emphasis on alpines. Our holidays since the 1960's, children permitting, have been looking at flowers through the whole of the British Isles, the Alps and the Rockies. Browse through our site to find out the plants available now. We offer a wide range of saxifraga's, sempervivum's,jovibarba's, bulbs and ericaceous plants, many rare and unusual, for the raised beds, scree, troughs and tufa.